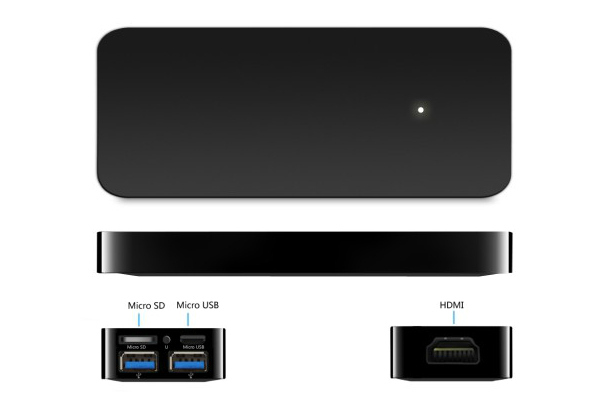 A new Rockchip Rk3066 dual core ARM chip processor based Android Mini PC has arrived, the UHost2. It is a bit bigger than your averaga Android mini PC, which might be good news, heat dissipation wise. We already told you about the -at that time inminent- wave of rk3066 based “Android on a Stick” computers that would wash over us. The new iterations of the rockchip workhorse are getting more and more refined, and this new Android Mini PC is a perfect example of it. Final pricing is yet to be announced, but we may think about U$S 65 for the entry level version (4gb Flash ram). The Uhost2 Android on a Stick computer comes with the usual stuff that we come to expect from any Android Mini PC, and then some: We get a nice GPU, Mali 400mp4 based graphics engine, the RK3066 ARM Cortex A9 dual core working at maximum speed (1.6Ghz), dual OTG USB ports, a micro USB port, an HDMI port, 1Ghz of RAM, Wifi b/g/n connection, and may be purchased with 4,8,16 .. up to 32Gb of internal flash ram. Of course, we get also a microSD expansion slot that will accept up to 32 Gb of extra storage memory. The Uhost2 comes packaged with a nice remote control and an HDMI cable, as a Plus. The Uhost2 comes with Android 4.04 installed inside, but there is an option for upgrading into Android 4.1 in the near future. There is also a Bluetooth version, but it is yet to be seen if it will be offered. Actually, at the time of this wrtiting, the whole Uhost2 is yet to be offered to the general public, altough some test units have been distributed around into different tech blogs for reviewing purposes.The Uhost2 is promised to get into market on early November this year.